Neighboring cells are linked to each other by multimolecular complexes such as adherens junctions, desmosomes, and gap junctions. These complexes help maintain tissue integrity, act as barriers to permeability, reinforce cell polarity, and allow cells to communicate with each other. 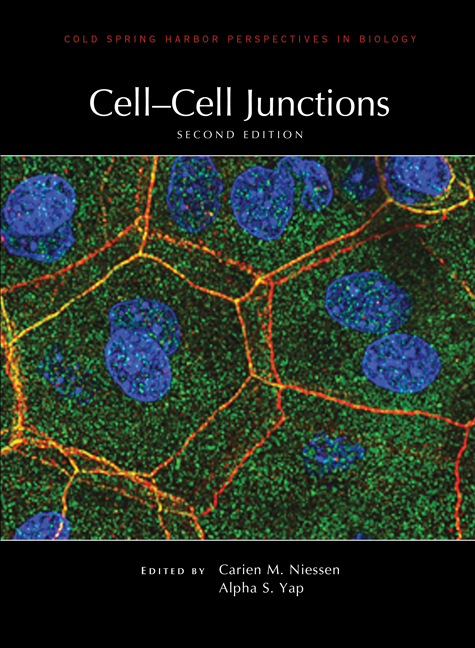 Written and edited by experts in the field, this collection from Cold Spring Harbor Perspectives in Biology reviews our understanding of the organization, regulation, and dynamics of cell–cell junctions and the roles they play in morphogenesis, tissue homeostasis, and disease. The contributors examine the assembly and structure of different cell–cell adhesion systems, the plasticity of cell–cell junctions (e.g., during cell migration), and how the junctions act as hubs to sense and transduce various mechanical and chemical signals. The authors also discuss the roles of cell–cell junctions in specific developmental and physiological processes, such as hearing, skeletal myogenesis, and neural circuit assembly, as well as in diseases such as cancer. This volume is therefore an indispensable reference for cell and developmental biologists, as well as anyone interested in understanding the roles of these complexes in human health and disease.